The Passover is the first of the seven annual feasts of God, which are grouped into three. God established these feasts and commanded the people of God to celebrate them as sacred assemblies throughout all ages. The first group includes the Passover and the Feast of Unleavened Bread, which are celebrated in the first month of the sacred calendar. The Lord’s Passover is on the fourteenth day of the first month, beginning at twilight. The Feast of Unleavened Bread begins on the fifteenth day of the same month. The second group includes Resurrection Day and the Day of Pentecost. The third group includes the Feast of Trumpets, the Day of Atonement and the Feast of Tabernacles, which are celebrated in the seventh month of the sacred calendar. The Passover is the core of the Bible and it has tremendous value for those who want to follow God. Through the Passover, God grants many blessings, including protection from disasters, the forgiveness of sins and eternal life. The Israelites were once enslaved in Egypt. For 430 years, they cried out to God asking Him for freedom. In 1498 BC, God answered their prayers by sending His prophet, Moses, to free the Israelites from Pharaoh. When Pharaoh refused, God sent plagues of blood, frogs, gnats, flies, pestilence, boils, hail, locusts and darkness. Before sending the tenth and final plague to kill firstborn males of men and animals, God commanded Moses and the Israelites to celebrate the Passover to protect them. The Lord said to Moses… “Tell the whole community of Israel… to take a lamb for his family, one for each household… Take care of them until the fourteenth day of the month, when all the people of the community of Israel must slaughter them at twilight. Then they are to take some of the blood and put it on the sides and tops of the doorframes of the houses where they eat the lambs… Eat it in haste; it is the LORD’s Passover… The blood will be a sign for you on the houses where you are; and when I see the blood, I will pass over you. No destructive plague will touch you when I strike Egypt. By putting the blood of the Passover lamb on the tops and sides of their doorframes, the Israelites were protected from the plague of death and finally freed from their years of slavery. Afterward, they began their journey to the promised land, Canaan. The Israelites witnessed the power of God through the Passover. This was the origin of the Passover. And God made it an eternal command that generation after generation must keep. In the Old Testament, God protected His people from their enemies and gave them many physical blessings when they kept the Passover. 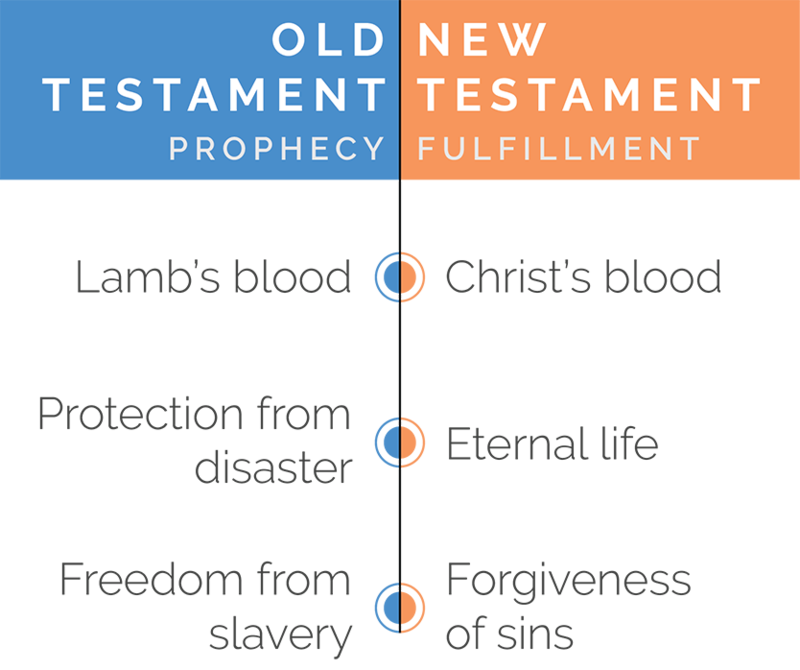 In the New Testament, God commands His people to celebrate the New Covenant Passover to grant them spiritual blessings—the forgiveness of sins, eternal life and the promise to return to the kingdom of heaven. Jesus Christ kept the Passover in the New Testament. However, He did not slaughter a lamb or paint its blood on the doorframes. During the New Covenant Passover, Jesus promised His body and blood for the forgiveness of sins. Jesus established the Passover for His people—for those who believe in Christ. The importance of the Passover goes beyond the forgiveness of sins. It is the only way to receive eternal life in order to enter heaven. After Jesus ascended to the kingdom of heaven, the disciples continued to celebrate the Passover in the Apostolic Age. And today, the Church of God keeps the New Covenant Passover as Jesus established it two thousand years ago at the appointed time—on the fourteenth day of the first month in the sacred calendar. For over 2,000 years, the truth of the New Covenant Passover has been hidden. Through the power of God, we are now able to realize that the Passover, which gives eternal life to those who keep it, has been restored. The Light of the Passover of the New Covenant is now shining to every corner of the world. And we have the opportunity to keep the promise God gave to us by shedding His own blood. Watch the history of the Passover and understand its importance to Christians today.